We are closed for the season. Thank you! Hi! 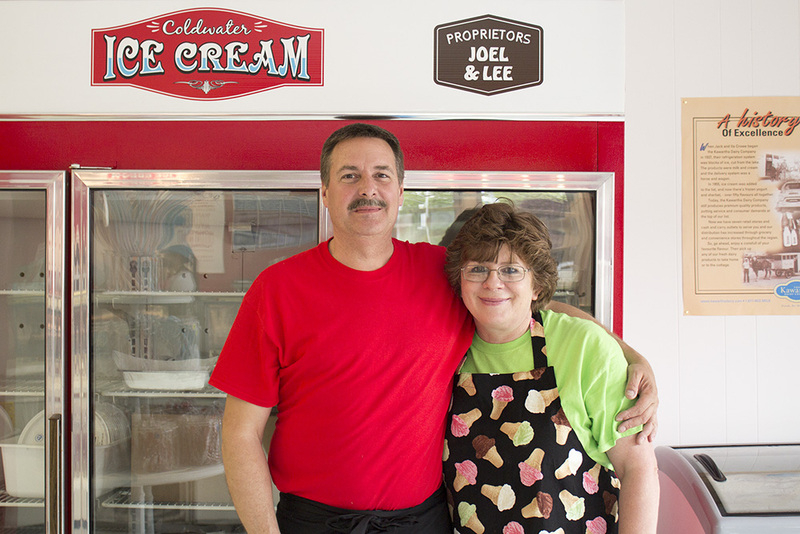 We’re Joel and Lee, proprietors of Coldwater Ice Cream. Welcome to our newest venture! Joel’s favourite flavour is Black Raspberry Thunder, and Lee’s is Salty Caramel Truffle. When not at the shop, you can find Lee gardening, reading, or trying out new fudge recipes. In his spare time, Joel likes to tinker with old cars. Together, we spend time with our kids, Cameron and Phuonganh, Cody, Kathryn and Bill, who visit often to test out new flavours. Be sure to try out our 32 flavours of Kawartha Dairy Ice Cream. We also offer frozen yogurt with fruit, Coldwater cookies and monkey tails to help you cool off on hot summer nights. Like us for the latest news and deals! 3 Flavours of your choice! Chocolate covered and sprinkled frozen bananas. White cake flavoured ice cream filled with rainbow chocolatey chips and a blue marshmallow ribbon. Cookie dough heaven! Loads and loads of chocolate chip cookie dough pieces in a cookie flavoured ice cream. A hidden gem many fall for after just one taste! French Vanilla flavoured ice cream folded into chocolate ice cream and swirled with Old English Toffee.